I’ve always known that writing about a difficult period of your life could be cathartic, healing; what I didn’t know was how hard it is. Some months ago, I discovered just how raw and painful it could be when I wrote about the two miscarriages I had last year. I don’t think I would ever have written about something so private, even just for myself, if I hadn’t seen the call for submissions for an anthology on miscarriage. And to be honest, I don’t think I could have written about it at all if I hadn’t been pregnant again and reasonably sure that this one was going to stick. I’m not great with emotions at the best of times. That’s why I write. So I figured it was a good opportunity, at worst, to get it all out and, at best, to maybe get published. But once I’d started writing, it didn’t seem to work. Creating a story isn’t easy, but telling your own is next to impossible, especially when you haven’t really faced up to all the feelings you’ve been holding inside for so long. I had to let go of my wanky writer’s pretensions and my natural inclination to hold back on my feelings and just go with it. I wrote the first draft in a couple of days. I cried a lot. I thought it was crap, and that I probably wouldn’t end up sending it, but I finished it nonetheless. But when I read it back a few days later, I was surprised to find it was actually quite good. I usually edit a lot, but in this case I didn’t change much at all, just smoothed it over, tidied it up and sent it off. It did help. Writing about it helped me to realise how I really felt about the whole thing, and that getting – and staying – pregnant hadn’t completely erased the pain of what had happened. It made me value my relationship and treasure my friendships more, and to be grateful for what I’ve got in my life. Not long after this, I found out that my story had been selected for the anthology. 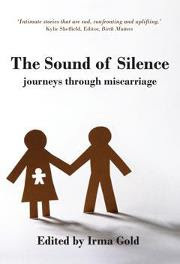 The Sound of Silence: Journeys through Miscarriage will be published and available in bookshops in October. You can see a trailer for it here. If you want to read my story, buy it. If you’ve had a miscarriage in the past, or you know someone who has, buy it. One in five pregnancies end in miscarriage, so chances are you know several people who’ve had one but who have never spoken about it. This book is about ending that silence and allowing the women (and their partners) who’ve been through it the chance to find comfort and to know they’re not alone, even if they choose to never share their own stories. Even now, three weeks off having my first baby, I still get tears in my eyes reading these stories. Damn pregnancy hormones. But I’ve learnt that not everyone is as lucky as I’ve been. And I’ve learnt that one gain, no matter how great, doesn’t cancel out previous losses. It just makes them easier to bear.